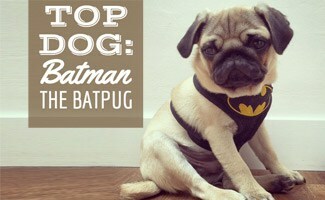 Batman the Batpug is an adorable pug from the UK who love dressing up as (well you guessed it) Batman! He might not have superhero powers, but he is super cute and has one funny sense of humor. He’s also quite talented and has his own App which allows you to share adorable pug emojis on your keyboard (genius right?). 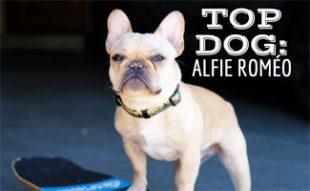 Read on to learn more about how Batpug came to be a celebrity dog and have a good chuckle in our latest Top Dog interview. How did you and your parents find one another? My parents found me through family friends. I love my original family and am super happy my new parents are as awesome as they are. I wouldn’t change a thing! What’s your life like in London? I love London (Gotham)! I go into town every day with my Dad on the buses to his office. From there I patrol the streets and make sure everyone is safe and the criminals are kept in order. 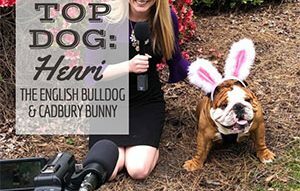 I get recognized quite a lot by people and have my picture taken all the time. I don’t mind and I like to make people smile. Lots of local shops know me as well, so there is always a treat or two I can expect when on patrol, which is great! How did you find your way into the spotlight? My Dad initially started my Instagram account because he thought it was more fun to post stuff on social media about me than himself. He didn’t just want to flood his Facebook feed with my handsome face (not sure why though, who wouldn’t want to see me?!) It was when he started my Facebook page though when it really took off. An early video of me with a leaf quickly gained about 3 million views, and it quickly grew from there. I now have about 250,000 followers on Instagram, Facebook and Snapchat and I love each and every one of my followers. I really appreciate all of their support! We love your Pug Emoji App. Can you share more about it? My Dad loves Emojis and sending digital stickers to his friends. He’s always wanted to be able to send cute pug faces though, as it’s a better reflection of his personality (although he’s not cool enough to be a pug). It was one day when we were in the pub together that I suggested building a special Pugmoji sticker keyboard, just to keep him happy. He thought it was a great idea and it went from there. Within 24 hours it went to number 1 on the App Store, something I’m very proud of. 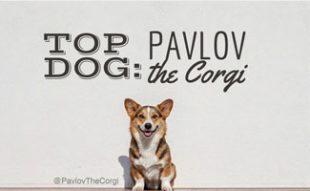 What was it like developing an App as a dog? It’s a little tricky, not having opposable thumbs and all that, but I am Batman and have access to some of the most sophisticated technology on the planet. So with a little help from Alfred but not so much from Robin (he’s easily distracted), I soon had the first working prototype ready for launch. What are some of your favorite past times? Eating, sleeping and going on walks… in that order. I absolutely love going for walks on the beach. There are so many inanimate objects to bark at there for absolutely no reason whatsoever. It’s the best! I can do that for hours. I am amazing at triple backflips off of building tops, but only when no one is looking. If someone asks me to do a trick, “sit” is pretty much the best you’ll get from me. What do you feel is your best feature and why? The wrinkles on my face. Mum and Dad absolutely love them. If you look closely, you can actually make out the Batman symbol. Proof that I didn’t choose the Batpug life, it chose me. 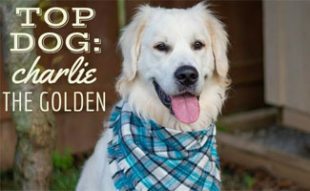 Who’s your favorite fellow celebrity dog? Have you met Queen Elizabeth? The Queen and I go way back. I walk past her pad (Buckingham Palace) pretty much every day. I’ve had loads of photos with the lovely policemen and women outside the front. They’re always so kind and happy to see me. One of my best pals on social media is Doug the Pug. We were lucky enough to meet up a little while back when he was on his world book tour in London. We hung out in all the main hot spots, ate so many treats, barked at so many things. It was one of the best days. Want more Batpug action? This adorable clip shows what happens when you stop rubbing his belly (spoiler alert: it’s funny). Thanks Batpug for taking the time to chat with us! What would you ask Batpug if you had a chance to sit down for a cup (or dog bowl) of tea? WHAT? 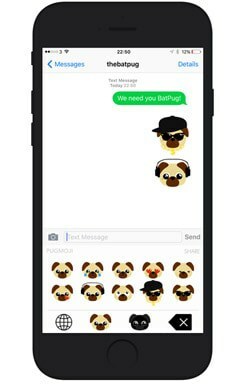 A pug emoji app? LOVE it! I have a pug and am totally going to get this as everything is cuter sent as a pug. Thanks Batman.